The quintessential 19th-century New England poet wrote "Paul Revere's Ride," "Evangeline" and "The Song of Hiawatha." 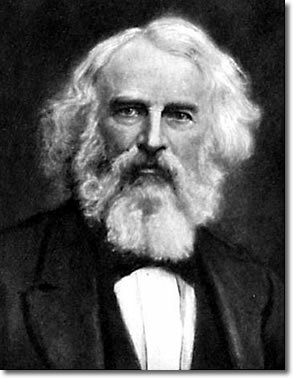 Born in Portland ME, Henry Wadsworth Longfellow (1807-1882) attended Maine's Bowdoin College, later became a professor there, and also at Harvard College in Cambridge MA, where he spent most of his life. His stirring, musical, lyric poems captured the spirit of America in mid-century 1800s, when American literature was struggling to depart from European forms and subjects and create a new American literary voice. Longfellow's work was controversial during his lifetime. Although he was a friend of Ralph Waldo Emerson's, his poetry was criticized as "children's verse," perhaps because of its accessibility and romance. However that may be, he was the most famous and successful poet of the time, and is the only American poet to have a bust in the Poets' Corner of London's Westminster Abbey.